Zircon & Burlap Attack Warren For Insensitivity To The "Millions Of Thousands Being Killed By Illegal Aliens" - Joe.My.God. “Shame on Senator Elizabeth Warren for being insensitive and dismissive of the tragedy that happened to Mollie Tibbetts. That is so sad. The mere fact that she don’t understand that millions of Americans want border security. It’s the reason why she need to be voted out of office. I heard her talk about family separation at the border. What about these families or these millions of thousands of Americans that’s being killed by illegal aliens that’s being permanently separated from their families. They will never be able to see their loved ones again.” – Zircon or Burlap (still don’t know which is which), speaking this morning on state television. 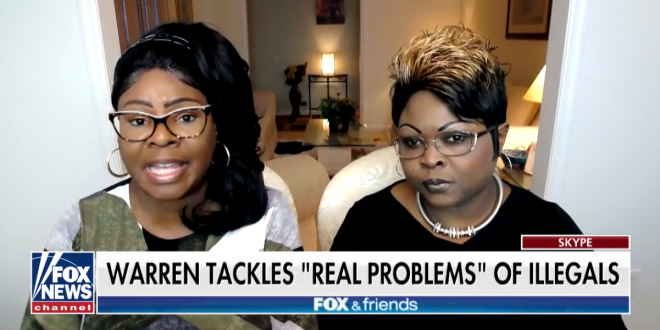 Interestingly, Fox selectively cut the interview in order to get Warren’s controversial line that “we need an immigration system that is effective, that focuses on where real problems are,” but they left out the context where she also spoke of the need for laws that “focus on people who pose a real threat” when it comes to migrants. Brian Kilmeade bemoaned the “pivot to politics” in Warren’s answer, so Diamond & Silk seized on that right away and said she needs to resign if she can’t acknowledge the “millions of thousands of Americans” who’ve died because of criminal aliens.